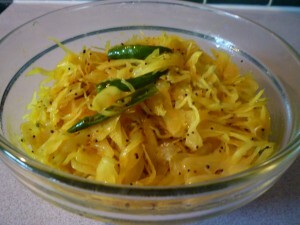 Sambharo is rather like a spicy cooked salad always served up as a condiment to a main meal. It’s usually made with carrots, white cabbage, raw mangoes, raw papaya and hot green chillies – stir fried in oil, mustard seeds and turmeric. It can be served hot or cold. This kind of a salad is my favourite and any leftovers are used as sandwich fillers for my lunch. A lot of Indian takeaways serve a small portion of sambharo with ganthia. Most gujarati thali’s will have a serving of sambharo. Sambharo is always made hot and spicy and served in a very small portion as it’s usually served to give the main meal a hot spicy taste. This is a simple version of the sambharo and it tastes great too. 1. Heat the oil in a saucepan. 2. Add the Mustard seeds. When the mustard seeds stop popping, add the cabbage. 3. Stir fry the cabbage and allow it to be coated with the oil. 4. Add the salt, turmeric and sugar (or not). 5. Stir fry the cabbage and do not cover it with a lid as the cabbage should remine slightly el dante. 6. Add the lemon, stir and transfer the sambharo to a serving dish. Note: You never add garlic or ginger or chilly powder to this dish. Nor do you garnish it with coriander etc. Tip: You usually serve it as an extra with your main course or with certain Indian snacks such as lamba gathia. Tagged cabbage, indian, recipe, salad. Bookmark the permalink. Delicious sambharo…love to have with gujju snack fafda and jalebi..also with moong daal too !! Thanks ladies for your kind comments. This one has been a favourite of mine since childhood. Yo Minaben, thank u for the recipe. My mom used to make this many years ago in Tanzania. I made it, it was yum.